Facebook held an open meeting at 10am Tuesday morning in Menlo Park. The whole company was invited to gather and ask questions about the recent—and rather furious—scandal around how Cambridge Analytica, a private data company hired by the Trump campaign that acquired and leverage information on over 50 million Facebook users. Facebook general counsel Paul Grewal was at the meeting to provide some answers. Mark Zuckerberg was not. Don’t act surprised. Mark Zuckerberg never shows up when the world demands his response to something unsavory. Why should he start now? For the record, Sheryl Sandberg was also notably absent from the Tuesday morning meeting. She and Mark are presumably too busy trying to figure out how to bandage up Facebook’s battered reputation and possibly to stop the stock price from bleeding billions more dollars into the abyss. After the Cambridge Analytica story broke over the weekend, Facebook’s market value plummeted by a staggering $50 billion. It would have been nice to hear such outrage spewing from Zuck’s mouth. But the 33-year-old college dropout doesn’t like to admit when he’s been hoodwinked. Zuckerberg also doesn’t like to suggest that Facebook’s policies enable anything except positive global change. This is the Facebook founder, CEO, and boy genius who wrote 6,000 words about Facebook “building global community” last year and failed to mention the word “advertising” even once. If you’d only read that sprawling essay, you might assume that Zuckerberg’s social network kept the lights on with hugs and pudding pops. But Mark Zuckerberg doesn’t want to talk about any of this unsavory money business. There’s nothing warm and fuzzy about a massive global corporation gathering up so much data on its users that even its own engineers don’t know how much the algorithms are collecting. Mark Zuckerberg is nice-guy nerd who’s busy traveling around the United States to meet the people and learn what America’s really all about. More recently, he’s the sensitive CEO type who’s dedicating this whole year to making Facebook better, which is his job but we should applaud him for doing it, shouldn’t we? Two days later, one of Zuck’s lieutenants showed up with a plan to cut down on fake news and hoaxes in the News Feed. That solution actually ended up creating even more fake news, but that’s not the point. When faced with a scandal or something that sullies his idealistic pitch for building global community, Zuckerberg will only deny what’s obvious: Facebook’s design suffers from fundamental flaws that favor data-gathering over privacy, and that model threatens the very pillars of democratic discourse. Facebook the company actually started a dialogue about this very topic earlier this year. Noticeably absent from that dialogue was one Mark Zuckerberg. This Cambridge Analytica scandal feels different. For the first time in recent memory, it feels like public outrage against Facebook and its sloppy data-gathering practice might actually compel the government to respond. Senate leaders are even urging Mark Zuckerberg to testify on Capitol Hill about what’s happened instead of sending a team of lackeys and lawyers, which is what the Facebook CEO usually does. 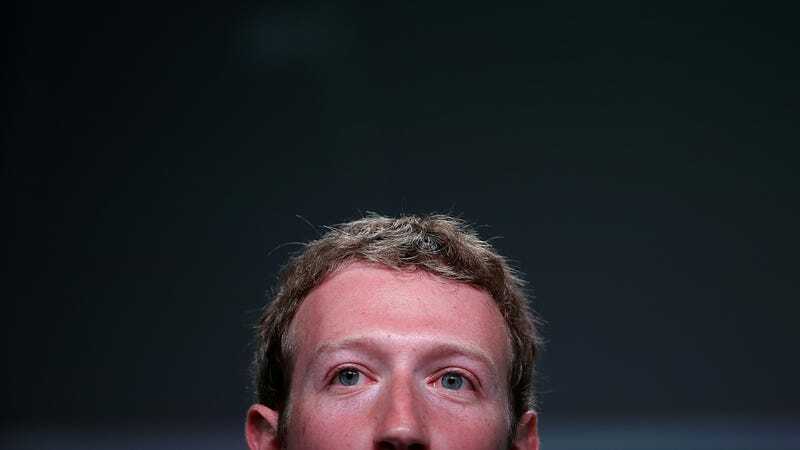 Who knows if Mark Zuckerberg will go to Washington. Don’t count on it quite yet. If Zuckerberg can’t face his own staff, how’s he expected to sweat under the hot lights of the Senate Select Committee on Intelligence. Got a tip about Facebook? Contact the reporter at adam@gizmodo.com.